There are 45,000 people living with dementia in Wales. Dementia devastates lives. To help lessen the difficulties of dementia, the Alzheimer’s Society Cymru is organising Cardiff Memory Walk. Every pound raised through the event will help the Alzheimer’s Society provide vital information and support, improve care, fund research and create lasting change for people affected by the condition. 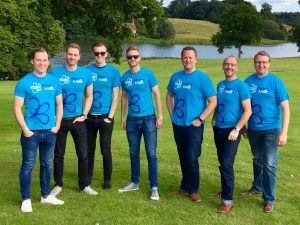 Only Men Aloud are all very proud to continue their support for Alzheimer’s Society Cymru, as many members of the team have personal experience of dementia in their families. They all became Dementia Friends earlier this year and have been involved in the charity’s fundraising events. Last year more than 4,000 people took part in Cardiff Memory Walk. The event is a great opportunity for all to join together, celebrate someone special, share experiences and unite against dementia. This year there is a Cardiff Day and for the first time a Cardiff Night Walk – highlighting that dementia happens around the clock. We are encouraging people to take up the challenge this year of ‘doing the double’.